Fr. 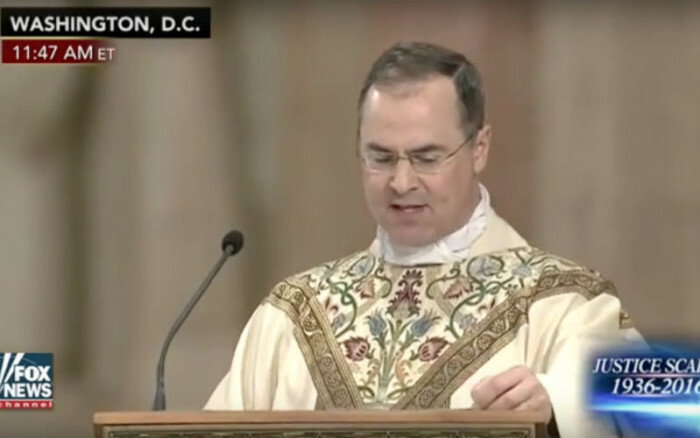 Paul Scalia, one of the nine children of the late Justice Antonin Scalia, delivered a powerful Christocentric homily at his father’s funeral at the Basilica of the National Shrine of the Immaculate Conception in Washington D.C. on Saturday. Fr. Scalia was referencing the fact that Catholic funeral masses are offered for the repose of the soul of the faithful departed, rather than being simply memorial services. Fr. Scalia went on to list other reasons for gratitude: that Justice Scalia received the Sacraments, that he was married for 55 years, had a deep Catholic faith, and loved his country. Pray for the repose of the soul of Justice Scalia!